Earthy and creamy. It's all about balance. Roasted carrots with fennel and goats cheese is a quick and tasty dish to prepare. Serve it as a side to a main meal and you’ll have everyone thanking you. This dish is so easy. And tasty too! If you’re after something a little different to include as a side dish with your next meal you MUST try this dish of roasted carrots with fennel and goats cheese. As I’ve explained on numerous occasions, I adore the aniseed flavour found in fennel. Pair it with something earthy and a little sweet and top it off with something creamy. This combination works beautifully! These carrots looked way too good when I spotted them at the markets recently. Rather than turning them into a soup or a mash they were roasted at a high temperature and served along with some keftedes and some domatorizo. 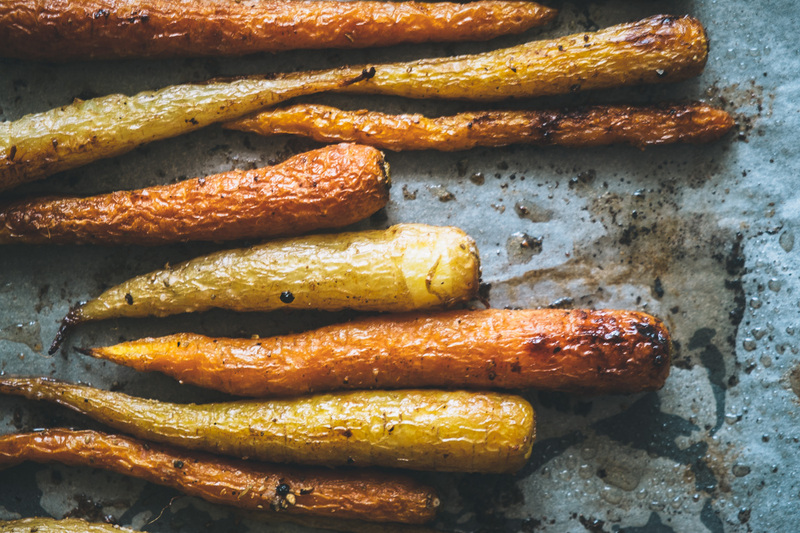 roasted carrots with fennel and goats cheese…the best side dish! I’ve used freshly ground fennel seeds in this dish which I ground in a mortar and pestle. The flavour is subtle but you can definitely taste it’s there. I had also wanted to use goats curd instead of the cheese but couldn’t find any. It still was a treat! Garnish it with some aromatic coriander and this is a side dish you won’t be forgetting in a hurry. Scroll down to see the roasted carrots with fennel and goats cheese recipe. Preheat your oven to 190 deg c.
In a large bowl combine the carrots with the olive oil, ground fennel, salt and pepper. Place on a baking tray and cook for 25-30 mins until the carrots have "wilted" and the edges are crispy. Serve with crumbled goats cheese on top and garnish with freshly chopped coriander.